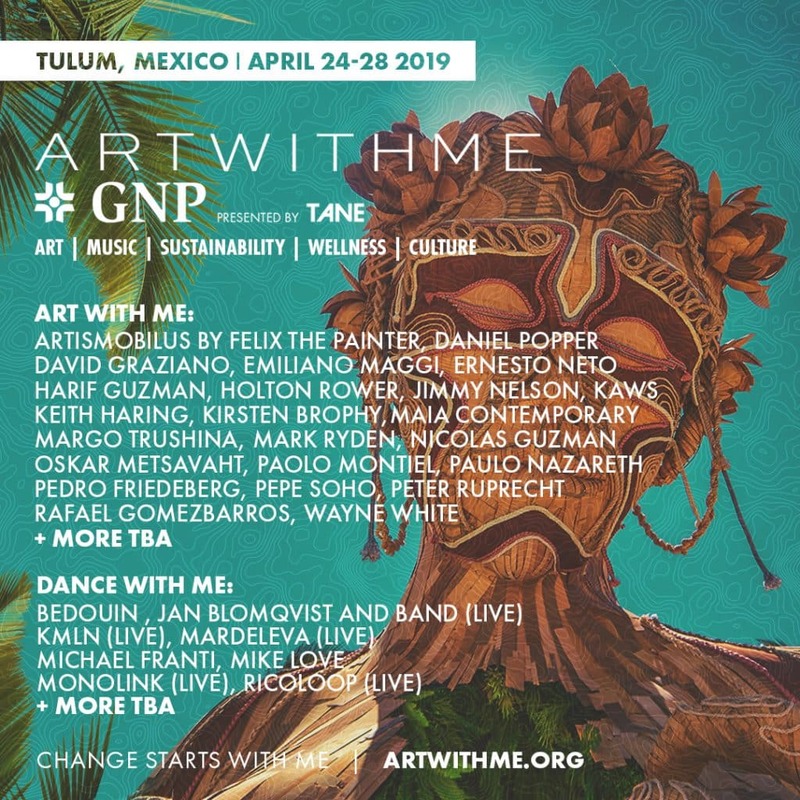 Art With Me *GNP “Presented by TANE” emerged in 2018 as Tulum’s first Arts & Ecoculture Festival. With this year’s festival taking place from April 24-28, we are proud to announce the phase one line-up of international artists and musical acts. Art With Me *GNP is a community-driven festival offering programming across seven core pillars encompassing art, sustainability, music, wellness, culinary, and family as a platform to inspire change. Our theme for 2019 is Change Starts With Me, and a key focus of the festival is bringing awareness and solutions to the infrastructure and environmental challenges that Tulum faces with the mission of building a sustainable future. Art With Me *GNP will showcase a diverse range of exhibits, including works from Mexican surrealist artist and designer Pedro Friedberg, Brazilian large-scale biomorphic installation artist Ernesto Neto, legendary New York City street culture artist Keith Haring, American painter dubbed “the godfather of pop surrealism” Mark Ryden, multidisciplinary artist known globally for his larger-than-life sculptures Daniel Popper, four-time Emmy Award-winning artist Wayne White, Colombian sculptor Rafael Gómezbarros, and Canadian artist and nature guide Kirsten Brophy. Other phase one artists include political Afro-Brazilian artist Paulo Nazareth, key member of the Mayan Warrior and Ilumina teams and James Turrell collaborator Paolo Montiel, Russian artist whose work is featured in the Tulum based IK LAB Margo Trushina, Brazilian fashion designer known for his focus on sustainability Oskar Metsavaht, Mexico City-based art gallery MAIA Contemporary, New York City artist known for his provocative pieces Harif Guzman, and many more amazing artists noted here. Art With Me *GNP’s musical program, Dance With Me, will bring a diverse group of performers that includes acclaimed vocalist, filmmaker, and humanitarian Michael Franti, globetrotting Brooklyn house duo Bedouin, a live band performance from Berlin-based techno artist Jan Blomqvist (Live), award-winning reggae and roots artist Mike Love, German songwriter and producer known for his ambient approach to performing electronic music Monolink (Live), a live performance from Mardeleva (a group that includes Habitas founder Eduardo Castillo), multi-instrumentalist and songwriter known for his one-man performances RicoLoop (Live), and international house and techno duo KMLN (Live). Care With Me, the festival’s environmental pillar, is focused around the core mission of bringing ecological awareness and sustainability to Tulum and the planet. Care With Me’s programming includes inspiring talks, workshops, indigenous ceremonies, recycled artwork and interactive experiences to educate and encourage festival attendees to adopt conscious and sustainable practices while in Tulum and back home. Care With Me’s activities extend beyond the festival by working with the local community, businesses, the municipality, NGO’s, and environmental organizations year-round to help the region address environmental issues related to its rapid growth. Attendees can take the Care With Me Pledge, which urges those interested in these issues to become a part of the solution. Guests will also have an opportunity to experience the Eat With Me program, curated by Chef and Owner of Tulum based restaurant ARCA José Luis Hinostroza. Mexican chefs will be showcasing their innovative menus using native ingredients at some of Tulum’s best restaurants and pop-ups in our Beach and Town Pavilions. Other highlights include Breathe With Me, a robust wellness program including Mayan clay ceremonies, women’s circles, plant medicine healing, cacao ceremonies, drum circles, Ayurveda workshop + tasting, ecstatic dance, yoga, traditional Mayan sweat lodge, and Temazcal. Art With Me *GNP is a family-friendly experience. Our Play With Me programming includes fun events curated especially for kids and families designed to inspire creativity and thoughtfulness in our future leaders. Additionally, Give With Me programming will feature free concerts, talks and art designed to help spread awareness about our mission in the local community. More information about the above pillars and programming will be announced in the lead-up to the festival. Those interested in attending Art With Me *GNP can find more information on our website and purchase tickets to attend the festival here. Early bird tickets have already sold out and Tier One tickets are moving quickly. Art With Me *GNP understands the impact of large crowds on the infrastructure and delicate ecology of Tulum and is limiting ticket sales to create an intimate experience for festival goers. Art With Me is a boutique community-driven festival that curates art, talks, music, wellness and cultural experiences as a platform to inspire change and foster awareness amongst attendees. The festival debuted in 2018 as Tulum’s first Arts & Cultural Festival and will be returning in 2019 from April 24-28. The festival was co-founded by Ahau Collection founder David Graziano and Tulum resident Jorge Mondragon with the goal of uniting Mexican and American businesses, tourists and the local community to spearhead environmental and cultural initiatives for the benefit of Tulum. Our mission is to inspire and activate the community to help preserve Tulum while having fun at the same time. Our Care With Me program works year-round to support projects that help solve Tulum’s solid waste management problem and promote a sustainable future. 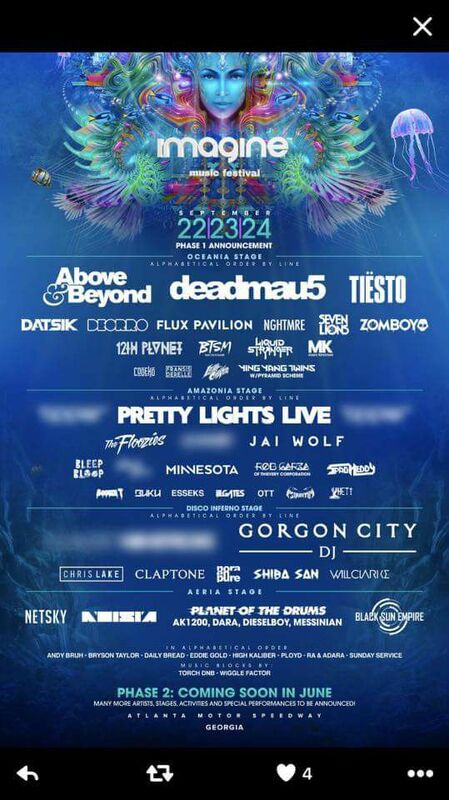 Join us to experience 200+ activations and 30+ musical acts in one place.